"My goal is to help you develop specific skills in casework and materia medica study - grounded in traditional homeopathic philosophy - which you can apply productively in every-day practice." 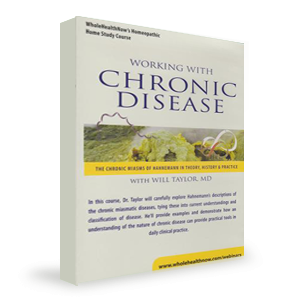 Dr. Will Taylor, a research scientist, medical doctor and naturalist, will bring nearly three decades of clinical experience to this in depth discussion of chronic disease. I am so delighted to have discovered Dr. Taylor as a teacher. He is among the best I have encountered. His depth of knowledge, understanding of disease, and humility make him a joy to learn with. He presents a high bar with his dedication to excellence, which inspires us to reach farther with our own professional development. Documentation of Homeopathic Education Hours* - The full completion of this course provides 12 hours of Homeopathic Education. *To receive Homeopathic Education Hours: You must watch the recorded sessions, and complete all quizzes with a score of 80% or better within 6 months of your enrollment in the course. After this 6-month period, the quizzes and Letter of Verification may no longer be available. Please be sure to print and safeguard your Letter at the conclusion of the course. Partial course credit is not given for WHN courses. I adore Will's presentation style, have had him several times as a teacher at the school I attended. I appreciate his sense of humour and movie quotes. I will listen to him anytime. If I could afford to take all his online classes, I would. Please tell Will Taylor that I thoroughly enjoyed his course and he is a fantastic teacher. He has such an easy going manner, very in depth knowledge, humor and clear teaching that it is pure pleasure to hear him. Working with Chronic Disease is another in WholeHealthNow's ongoing At-Home Learning Series, offering high-quality, affordable homeopathic education.